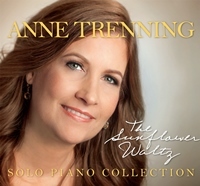 Anne Trenning greets us with her fourth album, The Sunflower Waltz. This album focuses on solo piano workings and is comprised of ten original compositions and six re-imagined pieces. All of the songs are played on the spectacular Shigeru Kawai piano, each note presented in clear and crisp fashion, tempting the listener with each keystroke. The first piece on the album is “Max’s Birthday.” Floating and light with all the potential a new year of life can bring, this track frolics and dances to the music of life in all of its mysteries. A puppy racing through the lawn, a young boy chasing after him with laughter trailing in the wind. The gentle imagining of this piece invokes musical nuance that carries through the entire album. “In the Gloaming Light” is the eighth track on the album. It is a walk through a sea of memories, a bittersweet blend of nostalgia, longing and regrets. A collection of photographs under the bed from an era gone by, this piece resurrects the voices of the past. Note after note, a composition emerges of lives lived and bonds forged to last forever. “The Sunflower Waltz” is the title track to the album and one that is lush and filled with joy. The whimsical dance of each note summons the child in all of us, freely dancing in a field of sunflowers. The sun shines down on us as we spin and let the vast blue sky envelope us. Such a happy tune and one of my favorites on the album. “A Prayer for the World” is the last piece on the album. Tender melodies comprise this composition. Each stroke of the keys is a prayer for humanity in all of our foibles and shiny imperfections. It is the air we breathe, the decisions we make both good and less stellar. Each twisting and turning chapter of the song inches us closer toward unity with our maker. Anne Trenning is a talented artist and composer. Her work with the solo piano in The Sunflower Waltz is mesmerizing and a soothing experience that I highly recommend. Twisting melodies that embroil you in their simple grace, each of the sixteen tracks takes you on a journey outside of yourself. A great listen.